Over the next three weeks, we are going to be posting a 3-part conversation between David Gauntlett and Amy Twigger Holroyd (posted each Thursday, from 1 May 2014, on our respective blogs at davidgauntlett.com and keepandshare.co.uk). Amy is the brilliant designer, maker, writer and researcher, who founded the experimental knitwear label, Keep & Share, ten years ago. In 2013 she completed a PhD in amateur fashion making – ‘folk fashion’ – as a strategy for sustainability. The study explored re-knitting: the use of knitting techniques to rework existing knitted garments. Nowadays she is a Research Fellow in the School of Design, University of Leeds. Her work has been featured in many magazines, newspapers and journals, from Vogue to Fashion Theory, and in books including Sustainable Fashion and Textiles: Design Journeys by Kate Fletcher, The Culture of Knitting by Jo Turney, and Knitting: Fashion, Industry, Craft by Sandy Black. She blogs regularly about her work at www.keepandshare.co.uk/blog. Over time, through a shared interest in craft and making, design and creativity, and other things, we have become friends, and we decided to discuss some of the things that fascinate us, for our blogs. The three posts in the series are #1, ‘On design, and systems’, #2, ‘On sustainability’, and #3, ‘On small steps’. So for this first one, we decided to start by talking, rather generally, about design and what it means to us. DG: I’m interested in design, basically, because it seems to be about doing things, or doing things better. Whereas the discipline or disciplines that I come from, they seem to be about commenting on things, or describing them, or providing frames for understanding them, but not really about doing things or making things. The ‘describing’ role is the most tedious, whilst the ‘frames for understanding’ role can be rather good, but in either case, it’s not at all ‘hands on’. Now, I’m not a big fan of ‘disciplines’, and the idea of boundaries between disciplines. I genuinely have no idea why anybody would really think that ‘disciplines’ serve any purpose really. But nevertheless, in terms of my own ’discipline’ background, I started off by doing a degree in Sociology, and then an MA in Sociology and Gender Studies, and then a PhD in an ‘Institute of Communications Studies’. Now, I think Sociology is regarded as a discipline, but I’m not sure if Gender Studies is a discipline … maybe it’s just an area of Sociology. Similarly, I don’t know if Communications Studies is a discipline. There’s lots of people who’ve written things about media and communications, but they come from a range of backgrounds and fields of interest. I’d be quite happy to count all of that as Sociology, in a broad sense, as well, I think. But nowadays I’m happier just saying I work in a Faculty of Media, Art and Design, because then it sounds like I might actually do something! And there is some ‘practice’ to integrate with the ‘theory’. Design, in particular, seems to be about using creative activity to address problems, or questions, and so … well, I like that. ATH: I think that to me, design means action, change, and creativity – so, pretty close to your thoughts about ‘doing things’ and ‘using creative activity’. What has always excited me about design is the opportunity to do something new, to bring about a change in the world. I trained as a fashion designer, so for some years my design practice was mainly about making new stuff – garments, in my case. Recently I’ve become interested in broadening my design activity to include designing systems and services, and structures within which other people can be creative. Even more broadly, I think that a design attitude does encourage you to try to bring about change, rather than accepting things as they are. Like you, I’ve been frustrated by academic research that describes some sort of negative situation, but doesn’t make any suggestions about how it could be improved. On the other hand, it might be dangerous to swan about trying to bring about change, without really understanding a situation – so I think that designers, and ‘design activists’, could benefit from some of the ‘frames for understanding’ you described. DG: Oh well that’s nice – that makes sense. ATH: So, whereas you’re looking for some practice to integrate with the theory, I’ve been hunting out the relevant theory to enlighten my practice! DG: This may be pointlessly pedantic about my own biography, but I do, incidentally, think I’ve always had some kind of practice, whether that has been making websites, or – later – online videos, or drawings, or even writing itself, or whatever. It’s not unfair to the idea of ‘practice’ to understand it quite broadly, is it? ATH: Oh no, that makes sense. I think of writing as part of my practice too, actually – it shares many characteristics with designing a collection of knitwear! Gathering inspiration, generating some rough ideas, refining and combining them to produce the finished article… So I guess we’re saying that theory and practice are always entwined, but perhaps there’s a happy balance that can be achieved between the two? DG: Yes. And going back to what design means, I think it’s useful and important to ‘reclaim’ the term design, to be about something very useful and important, rather than the popular association between design and something flashy-looking. Design museums tend not to help on that front – they still tend to show some cool record sleeves and a classic telephone and an impractical chair. I can admire those things too – well, nice record sleeves and pleasing technology designs, anyway, but not the chairs, I’m sick of seeing chairs in design museums – but where they are about making things look a bit nicer, then yes that’s part of design but I think it’s about 5 per cent of what design does. You saying ‘design means action, change, and creativity’ is much better – and the ‘design attitude’ where you’re inclined to change things and make them better – that’s what it’s all about. ATH: Yes! And of course, that ‘design attitude’ can pop up anywhere. It means that design shouldn’t stay in its own disciplinary silo (which of course you’re not a fan of anyway), but really is an approach that can, and should, be applied very broadly. DG: You mentioned ‘designing systems’ earlier. I’m interested in systems too. But what did you mean by it? ATH: Well, I’m sure there are established definitions that I’m ignoring here, but to me a systems view is about taking a holistic approach, and understanding how things relate to each other. And so design in this context might involve designing relationships and paths between things, rather than just focusing on individual products or services or whatever. And I think those ‘things’ are both tangible and intangible, and therefore this sort of design should include individual people’s experiences and attitudes and emotional responses, as part of the system. I think a systems view can operate at different scales. For example, I like to try to take a systems view of fashion – which requires a pretty epic perspective – and aim to alter flows and relationships within that system through design interventions. I recognise that that’s pretty ambitious! At a smaller scale, in my work I’ve tried to design systems that support people in being creative and designing for themselves, in specific contexts. So, that’s me. Can you tell me about your interest in systems? DG: Erm I think I have a number of interests in systems in different ways! I absolutely agree, the thing with systems is the recognition that everything is just part of a whole – or, to put it another way, everything is just one element amongst other elements, and they are all interrelated in some way. Even if connections are not obvious, there are often knock-on effects. So, to make this more concrete, for example it means that I think it’s silly to think about a communications medium, or set of media, such as ‘television’ or ‘the internet’, in isolation, because each of those things – as well as being very complex and not-at-all-singular in themselves – each of those things is just part of an ecosystem of other media, and society, and culture, and economics, and all the complex relationships between all those complex things. So that’s basically the wholistic view, and the ‘ecosystem’ model, which a focus on systems draws you towards. ATH: Yes! That’s exactly what I mean. DG: This also reminds me of my recent trip to Italy, where I found I kept stressing that things were ‘all part of the same thing’ – I can come back to that, more specifically, later! ATH: Oh no, go on, tell us now. DG: Oh well it’s just that in Italy – at least this is how the situation was reported to me, by actual Italians – there seems to be a big separation between their great craft traditions, which are all about carefully crafted things made by hand, and which are now associated with an old generation, and digital media, which is seen as being separate – almost the opposite – and done by young people. And there seems to be a sort of crisis of confidence in their craft traditions, and a fear about this modern internet destroying that kind of thing. And so for that reason, I kept finding myself saying that, for example, creativity, whether offline or online, old or new, is all part of the same thing, all part of the human drive to make and share things. It doesn’t matter if you’re making a physical thing by hand, or a digital thing by some more technological process – probably still led by the hands, in fact – it’s all part of the same thing. And if you’re a man trying to carve a small owl out of wood to give to your child, in 1714, or a woman making a short video for YouTube where she presents a poem about owls, in 2014, it’s all part of the same thing. The thing it’s all part of, the system here, is the system by which humans keep themselves alive in the world and engaged with each other and their environments, by making and sharing simple things which communicate some feelings, basically. DG: Another thing about systems is the idea that you can set up a kind of process, or environment, and then let it take on a life of its own, which you hope will be fruitful or interesting but you have no idea at the start what it’s going to be. An example of that would be the version of LEGO Serious Play, developed by Anna Sophie Trolle Terkelsen, which I call the ‘self extracting’ version, where you can basically hand over a box of stuff, which comes with some simple prompts on cards, to a group of people, and they do what the cards suggest, and a whole kind of experience unfolds, where they can learn about themselves, and each other, through building and talking. The cards are not instructions – they don’t tell you what to build – but the cards set tasks to build something that represents an idea or experience, metaphorically, and the cards ‘instruct’ the group on practical things, like, build for 5 minutes and then share it with the group. ATH: So is that what you mean by ‘self extracting’? DG: Yes, well that’s just the phrase I use, based on a sort of half-remembered thing, from the early days of Windows, when it had a thing called the ‘self extracting file’. I don’t really have much of an idea of what ‘self extracting file’ really meant in Windows terms, but it had a nice icon with a sort of box with things springing out of it, and I always liked this idea of a kind of box of delights which would open itself up and do something magical without you really having to do anything! If you know what I mean. You’d just click on it and then the delightful thing would happen. So, that’s like the idea of a system in a box, and you can hand it over, and people respond to it, and between them it does something unexpected and wonderful. ATH: I like the self-extracting file idea! I’ve got an ongoing project that relates to this – my Knitting Circle. It pops up at various events, and is basically a long knitted rope with loads of in-progress knitting growing off it at various points. People come along and join in, if they want to – they can stay for as long as they like, and experiment by changing the stitch or the colour or whatever of the bit they’re knitting. When they’ve finished, they leave their knitting for the next person to carry on with. As the whole thing grows, it visually reflects all the people who have taken part, and their creative experiments – and because lots of people are sitting together, it encourages reflective conversation about making, which I really like. I provide little tags, so people can record a fragment of the conversations they’ve had – and these, in turn, inspire new conversations. I’ve refined the design of the project over the years, so now it’s pretty ‘self-extracting’ – once it’s set up, people can see what the ‘game’ is, and join in without the need for instructions or anything. DG: Oh that’s very good – especially that it gets to a point where you don’t even need instructions, it’s just implicit and ‘obvious’ what people are meant to do with it next. That’s great. And so that’s an example of you designing a system. When I asked what systems mean to you, you also talked about altering flows and relationships within systems through design interventions. That’s great, but a bit abstract. Could you flesh it out with an example of the kind of thing you’re talking about? ATH: I’ll try! I think the whole idea of designing interventions within a systems view links to the ‘design attitude’ we were discussing earlier. If you have this design attitude, you can look at something – recognising its complexity and links to other elements – and start to think about how the system might be redesigned, or tinkered with. You might try to create new paths and connections, or support existing ones. For example – I’m interested in people making their own clothes, because I think that could bring lots of benefits for both sustainability and personal well-being. However, I know that many people are dissatisfied with things they’ve made, largely because they’re comparing them to ‘perfect’ items bought from the shops. If you take a narrow view of homemade clothes, they seem straightforward – but when you recognise the wider context, things are way more complicated. So, I’ve been looking at designing ways to support people in their making, to help them to be happier with that they’ve made. In my PhD research, this was about running a project that created a space where amateurs had ‘permission’ to design for themselves, and supported each other to develop and execute their creative ideas. That might seem a really tiny and insignificant change, but it could potentially have quite a significant impact on the way that fashion works, both sociologically and economically. To link back to the start of this conversation, I think that to take a systems view, you really need to take advantage of ‘frames for understanding’, as you called them – otherwise the complexity is just too overwhelming, and you can’t see the wood for the trees. So we’re back once again to the need for theory and practice to be entwined, I think – so you can try to change things, but really understand the context you’re trying to work within. 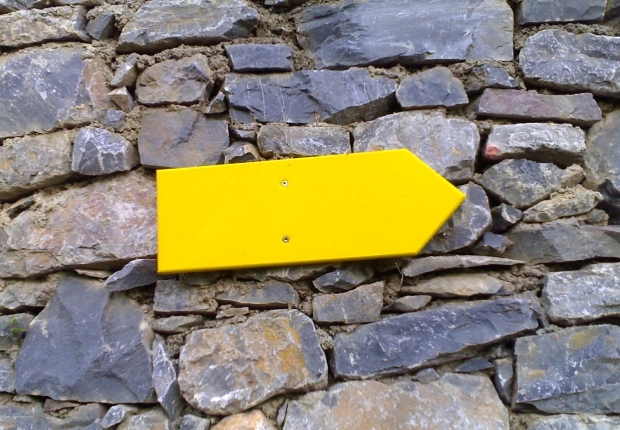 Yellow arrow photo by Flickr user Peter Rukavina (see original), used under a Creative Commons BY-NC-SA 2.0 licence.